Welcome To This Gorgeous 4 Bedroom 2 Storey Family Home. 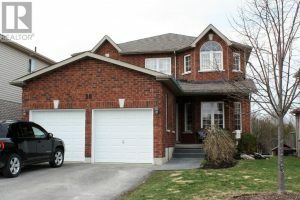 Main Floor Includes: Living/Dining Combo For Formal Entertaining, Eat-In Kitchen With Walkout To Rear Deck, Cozy Family Room With Gas Fireplace, Office & Mudroom With Walkout To Attached Double Garage. Curved Staircase From Foyer To 2nd Floor Which Features: Grand Master Suite With 4pc Ensuite & Walk-In Closet, 3 Good Sized Bedrooms & Laundry Closet For Your Convenience. Full Finished Basement Boasts: Rec Room With Bar, Walkout To Patio & For The Hockey Family There Is A Mini Stick Room For Plenty Of Family Fun!! Fenced Yard Backs Onto The Walking Trail. A Must See!